Big and small challenges, voluntary or unvoluntary changes, wanted or unwanted losses… are part of our lives whether we like it or not. „RE.SI.LI.EN.CE.“ is defined (in the psychological sense) as „an individual’s ability to adapt in the face of adverse conditions“. While our own experiences may have taught us a great deal about how resilient we are, it’s also possible to train one’s own RE.SI.LI.EN.CE. And this is exactly what this summer’s Coach and Chill with Caroline is about! Through practical exercises, exchanges and discussions with the other participants, you’ll be provided with tools that will enhance your level of RE.SI.LI.EN.CE. 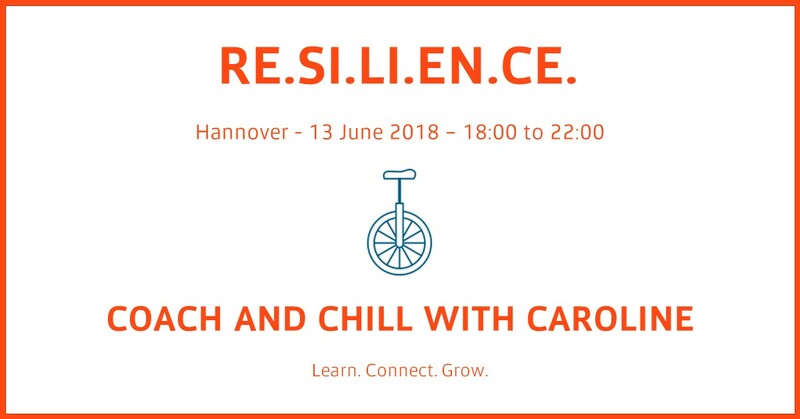 Join me and other like-minded people to this special Coach and Chill with Caroline for a deep dive into the topic of RE.SI.LI.EN.CE.! And bring friends/colleagues/relatives who can also be interested. You will feel empowered by your new knowledge, ready to take the next steps and inspired by the interesting people that you met and worked with. Your active participation is required if you want to achieve these gains… (in case you feel uncomfortable to speak in front of the group, note that it will not be necessary). 20:15 – 22:00: Chilling part of the event with some drinks and food and happy conversations. Investment: EUR 30 per participant (to be paid to: Caroline Grégoire, CG4 Coaching – IBAN: DE21 2504 0066 0861 0602 00 with CnCwC June 2018 as reference). In case of cancellation, please let me know in time (caroline.gregoire@cg-four.com or 01522-797 35 48) to allow other interested persons to attend. WELCOME and LET’S LEARN TOGETHER! You can read here what has been published so far.